In Pahalgam’s Siligam village is the Thoker House, situated on the banks of a bubbling conduit of river Lidder snaking by. Maryam, a 70-year-old widow, is the head of the family now. More than half a dozen years ago, as her husband Ali Muhammad, a labourer, passed away, the sole responsibility of running the family fell on the shoulders of their only son Aijaz Ahmad Thoker, in his twenties then. She got him married to Aafiya Akhter. The couple had two sons, Suhaib and Afaaq. Aijaz was the sole bread-winner of the 9-member family, comprising of his mother, wife, children and four sisters, one of them unmarried. Almost a month after the birth of Afaaq, the family lost Aijaz. He was killed on July 9, 2016, in the immediate aftermath of the killing of Burhan Wani. That morning, Aijaz had gone to almost all the abattoirs in the neighbouring villages to buy mutton for his wife, still in bed post-delivery. But life was frozen and businesses were closed. The only slaughterhouse in the vicinity yet to be checked was near Akad Park. Along with his friend Adil (name changed), as Aijaz went there, a protest was already going on in the area. Aadil denied him from getting involved, let alone offering himself. “But my son, as brave and pious he was, didn’t listen to his friend, and ventured to save the youth.” The forces let Aijaz come close enough towards the injured youth, but the moment, he would bend to pick him up, a bullet fired by the forces went through his skull. “The person that my son had gone to save that day is alive, but he, on the other hand, is no more,” a sob escapes Maryam’s trembling lips. The government paid a compensation of five lakh rupees to the immediate kin of the slain civilians who were killed in 2016. The blood money stands credited in the bank accounts of the minor orphans Suhaib and Afaaq, which they can withdraw when they turn adults. “But tell me, until then, how would we manage to bring them up?” a concerned Aafiya asks. The situation of almost all the orphans and widows in Kashmir is similar. Although no recent data exists, a 2008 survey by known sociologist Bashir Ahmed Dabla suggested there were 32,400 widows and 97,200 orphans in Kashmir and the number was growing. It excluded those named as half-widows– women who lack any information about their husbands, and their children. The widows and orphans in the study comprised wives and children of civilians killed by the security forces, of militants or those who were caught in the crossfire. Rubeena Akhter is one such widow. Just two years before the study, her husband Shabir Ahmad Dar was killed on September 14, 2006. She doesn’t buy the “popular” story about her slain husband. 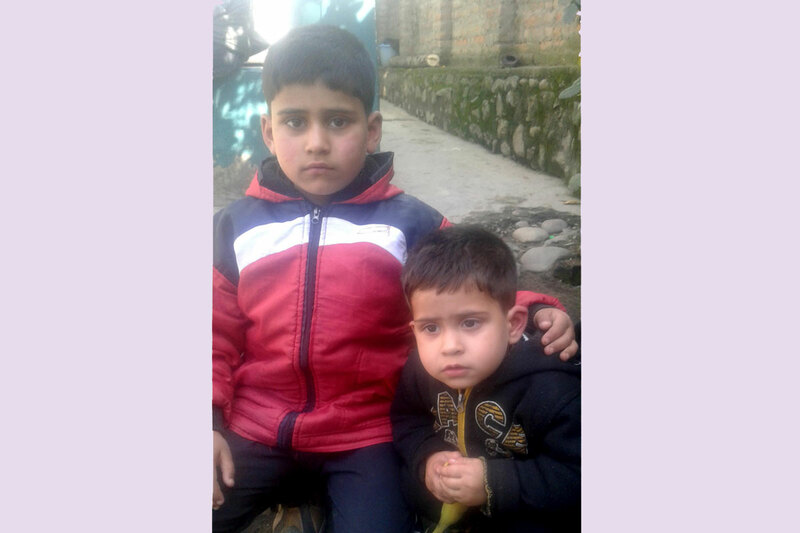 Shabir hailed from Pulwama’s Hathiwara village. A photographer by profession, Dar had his shop situated in the main Samboora market, a kilometre away from his home. Once in a while, he would go to video shoot the marriage ceremonies in the vicinity, and thus, in this way, manage the expenses of his family. Also, he was making little savings for their first baby, expected soon. Three days before the baby was finally due, some unknown people paid a visit to Shabir’s shop during broad daylight. They were on a bike. They asked him for video shooting a marriage in Gundabal village, some five kilometres away from Samboora. The neighbouring shop owners had seen him shuttering down his shop, and with his instruments, getting on the bike. With the shopkeepers, he had left a word for his family about his return till evening that day. Next day, Rubeena was having lunch, when the news about somebody’s beheaded body found in the Karewas of Lethapora spread like a wildfire, bringing disquiet to the whole area. It was like a “destructive hailstorm” for the Dar family when it was established that the body belonged to Shabir. It took a whole day for the family to locate the head severed from its trunk and traced at a different spot on the karewa. Then only the burial took place. Five days later, on September 18, a militant outfit staked the claim saying Shabir was the informer of the army and was responsible for tipping off the whereabouts of their Commander Bilal Ahmad Dar, which lead to the latter’s killing. Zahida, Shabir’s daughter is currently enrolled in the fourth standard. She hasn’t seen her father, but his pictures tell her how he looked like. To give her the share of the love of her father seems the only motive left for Rubeena now. She hasn’t ever thought of marrying again, although it has been almost 12 years now and she is just 31. “If I remarry, who would take care of her (Zahida),” she shares her worries. It is quarter to four, and Rubeena, outside her one storey house, situated on the banks of river Jhelum, is waiting on a road for the Dehli Public School (DPS) bus to drop her daughter. “Now if you ask me how I could afford to admit my girl in such an expensive school, you won’t even comprehend how I managed it,” Rubeena said. Kashmir’s widows and orphans have emerged as a significant group primarily because of the direct effect of armed conflict. With the continuity and intensification of the conflict, the living conditions of this vulnerable group have deteriorated to miserable sub-human levels. Apart from wives and children, most of the slain were the main source of dependence to aged parents and unmarried daughters. They all were reduced to destitution. But Najars’ of Awantipora were not that fortunate enough. The family comprised of four sisters and their old carpenter father, Abdul Rashid Najar. After his eldest daughter’s marriage, Rashid’s second daughter Roziya Jan married Showkat Ahmad Qasab from the neighbourhood. “My father was getting old, and there was no male member left in the family to take care of us in case of any eventuality, so he decided not to marry me out, rather Showkat was married into our family.” The knot was tied in 2010. 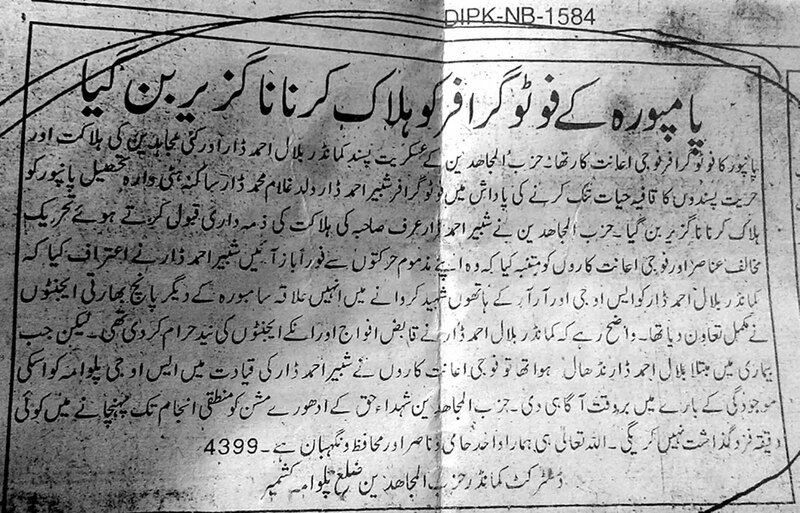 A news paper clip in which Hizb claimed Shabir’s killing. In 2014, everything changed. For Ramadhan, the month of fasting, Showkat wanted to stay home. His father-in-law was fine with the decision. He told Showkat to go back steering the wheels only after the Eid festival. One evening, Showkat left for Maghrib prayers but didn’t return. The family thought that he might have gone to his parents’ house. But it turned out to be untrue the next morning. Two months later, when Showkat’s dead body crossed the threshold of Najar house the family learned that he had joined militancy. Showkat was killed in an encounter in Pulwama’s Chersoo village. “He didn’t say a word, nor did he ever try to contact us during those two months,” Roziya said.